Years ago when I was in my early 50s I met a sky diver. After hearing how much he loved it, I decided I wanted to sky dive, too. I told my therapist girlfriend that I might have gone ’round the bend because I wanted to sky dive, had found a long-time dive center nearby where I was going to take classes, and was actually going do it. And so I did. And so I jumped. The first time I jumped attached to the front of my instructor. I loved it so much I went back for another, longer class then jumped by myself. That is, “by myself” — after going out of the plane with the instructor holding onto my sleeve until I pulled my rib cord — just to be sure I had not passed out. I got myself down without incident and felt quite exhilarated by the experience. I’ve always been glad for that experience. In great part that is because I live life as some do not: I don’t want to look back on my deathbed and regret what I did not do in terms of taking calculated risks– risks attendant to enjoying life and paying attention to my overall good health. What does this have to do with corseting and waist-training to improve one’s posture and perhaps lose some weight or trim down a bit? Quite a bit. It also has to do with life and making those inevitable choices in our activities of daily living. Corseting is one of those choices entailing some kind and some level of risk. Recently I heard that some online commentator on corsetry apparently claimed that her girlfriend of unspecified age was a corset fan. She was “slightly obese” , yet she was said to be 50 lbs. overweight. I imagine that most of us would consider that quite a bit overweight and not very “slight” at all. Her girlfriend with an unspecified health history, corseted with an unspecified corset for an unspecified time, waist trained in some unspecified manner for an unspecified length of time, had some kind of unspecified waist-training guidance or advice by some unspecified person or source (her mom was a corsetmaker, and most likely did contribute at least some experienced advice to her daughter and likely made the offending corset), her liver ruptured, and the girl died. At the ER room or later, “corset training was determined to be THE (emphasis added) culprit.” No other culprit was listed, not even the 50 lbs of overweight. 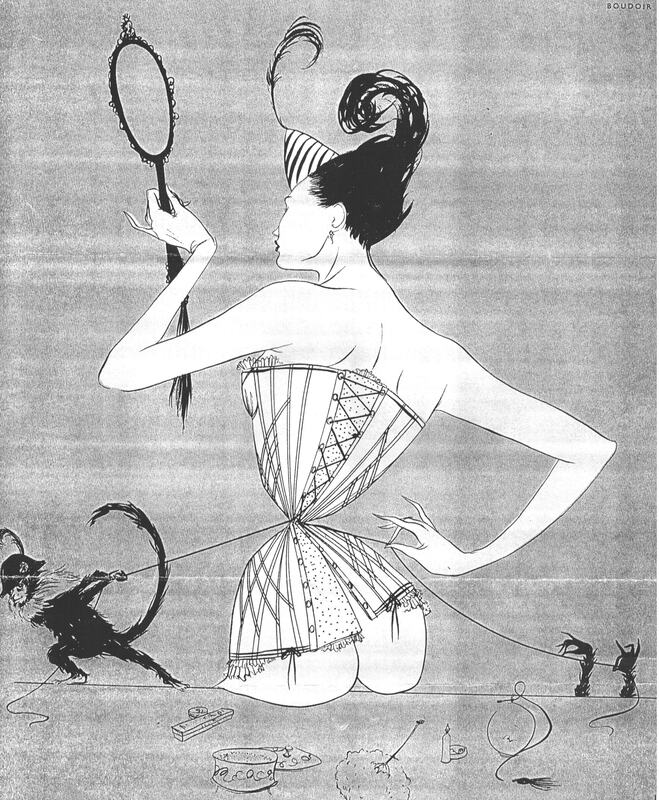 According to this writer (if my informant is correct about the online posting), her friend’s corseting practices caused pressure on her liver which ruptured, and corseting is more dangerous to women’s organs than pregnancy because internal organs move in unspecified and unpredictable kinds of ways. I am awaiting response from several medical consultants to ROMANTASY on the above matters based on their experience, research, education, and the probability of these claims. Anything is life is “possible,” but reason should compel us to look for probabilities if not medical certainties, in order to determine where to spend our money and effort in calculating our risks and choosing and pursuing activities in which to engage. Second, I’ve never heard of such a death attributed directly or indirectly to corseting practices in modern times, at least over the past 25 years. Not in all my 25 year of personal corseting and occasional waist training, nor in my 24 years of studying corseting, waist training, and purveying corsets plus coaching about 30 students in the practice, have I heard of such a result. As one experienced European tight-lacer told me, any health problem that exists pre-corseting, will exist and possibly be affected post-corseting. But “affect” does not necessarily and in all cases, mean negative affect. Above all, I hope that discussions online and in real time about corseting and waist training will remain factual, not merely opinionated and possibly ill-founded or based in mere possibilities, disregarding the inherent risks in just living. I hope that facts and calm heads will prevail, but expect it will not always be so even if corseting is more ubiquitous today with more enthusiasts than have existed for some time after the corset’s near-demise around the time of World War I. 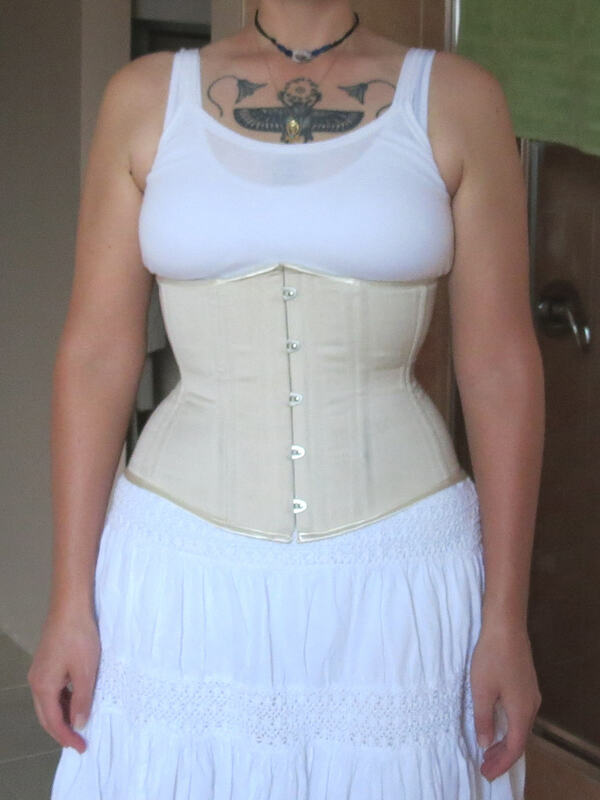 “I think a lot of my weight loss has to do with the corset, although I will say I’ve been pretty stressed the last couple weeks and haven’t really been eating much. I have struggled with a binge eating disorder for most my life and I put a lot of pressure on myself as far as body image. I’m finding wearing the corset though really frees my mind. I like the way I look in the corset and I haven’t been obsessing about my weight. This is huge for me so I think in that way the corset has had a significant effect on my weight loss and bringing piece of mind. I also really love the support it gives. Also I have problems with my posture and pain in my tailbone from sitting. I have found when I wear the corset I still tend to slump my shoulders a bit but I can sit now without pain in my tailbone, which is amazing!! “I’ve been wearing my corset all day from morning until I go to bed at night. Although just last week I went back to a previous job I had, which is working as a stable hand, and I don’t want to get my corset dirty. I’m thinking though I might wear it at work anyway. I really need the back support, especially since I have had some back injuries from the manual labour. After I take a shower from work though I put on my corset and wear it until I go to bed, which is about 5 to 6 hours. I’m thinking though, like I said, I might just start wearing it to work anyway…or else I’ll probably wear it to bed if I don’t wear it at work so I can get in more hours. “I really would like to stick with Sheri for my next corset. It so comfortable and perfect for me. I would like the back raised two inches though for the toothpaste, and I think it would help more with my posture. I also think the bottom could be lowered about a half inch to an inch…I realised the picture with the skirt didn’t really show where the bottom fell. When I sit down, there’s a little bit of pooch that sticks out on the bottom. “I would like to order pretty much the exact same corset from Sheri, only with some minor adjustments and obviously sized down. My middle is still pretty squishy, but at least not as squishy as it was. I think once I get to my third corset I might want to look into a prettier corset, I’m pretty focused right now on my corset being “a work horse”. “I’m ready to order my next corset now so it arrives by the time I’m ready for it. What else do you need from me to order? I was interested to learn about the Borg Scale of perceived exertion in my SF Examiner April 17, “Learn to be an 8 when it comes to exercise” by Renee Prosen. This Scale helps communication between health professionals, personal trainers and exercisers, to enhance understanding of how hard the person exercising, is working during exercise. The exerciser judges her amount of exertion, with 1-3 meaning she could go on forever, 4-6 meaning she feels like the muslin is doing something but there’s no reason to stop, 7-8 meaning she is really ready to stop, and 9-10 meaning how hard you would work if a car fell on your dog and you were trying to lift it off. Honestly–that’s what the article said! For students enrolled in my three-month waist-training coaching program, I also use a similar perceived scale, The Comfort-Discomfort Scale. It determines how challenging the three basic elements of any corset waist-training program are to the trainee. Of course, those elements are corset wearing, waist-targeted exercising, and corset-friendly eating and nutrition practices. And of course “perceived” means it is a highly subjective scale, but that is fine. I am one who believes that if a student perceives they are in pain, that’s not a good place for them to be because then they may well develop an antipathy toward their corset. They may find an excuse not to complete their waist training program, fearing how they will feel during the next day. They begin to associate pain with the corset, and that just won’t work. Here’s how our scale works. A 1 our scale means training is a piece of cake, while 10 means the trainee is in (has just entered) real pain and has reached what I call “the Big O”, or, “I WANT OUT OF THIS THING!” stage. I ask my students to keep themselves training at a level of 6 or 7 daily, at any one time of continuous wear of the corset for that day’s wearing schedule. I want them to feel challenged and even uncomfortable bordering on real pain, but not into it. I want them to feel like they have truly accomplished something when they take their corset off or rest after waist-targeted floor exercises that day. Of course, perceived comfort/discomfort can differ from hour to hour, minute to minute, or day to day based on a variety of factors and on individual reactions. A person who has a so-called high tolerance of pain could well say he is at a “4” when another person at the same level of restriction and size and experience, could say she was at a level of 9. The important point is how the student feels. Here corsetiere Sue Nice appears to be in about an “8” on the Comfort/Discomfort scale as she tries to lace on her front-laced corset! I always chuckled to see this picture taken at a ROMANTASY boutique fashion show some years ago. Can the scale slide in perception over time? Most assuredly it will. The more one becomes used to wearing a rigidly structured and tight garment, the less discomfort will be felt. A “9” today, may be next week’s “6”. But again, it doesn’t matter. The point is, a scale allows my student to tell me more about how t hey are feeling and lets me adjust their program and elements accordingly, so they always live on the edge of discomfort or even pain, but don’t step into it.